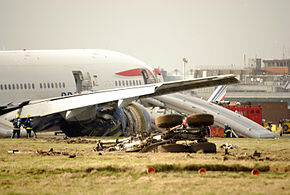 British Airways Flight 38 crash-landed at London Heathrow in 2008 after its fuel lines became clogged with ice crystals. In an internal combustion engine, fuel starvation is defined as the failure of the fuel system to supply sufficient fuel to allow the engine to run properly, for example due to blockage, vapor lock, contamination by water, malfunction of the fuel pump or incorrect operation, leading to loss of power or engine stoppage. Fuel exhaustion (also called fuel depletion) is defined instead as an occurrence in which the vehicle in question becomes completely devoid of usable fuel, with results similar to those of fuel starvation. All engine-powered modes of transport can be affected by fuel starvation, although the problem is most serious for aircraft in flight. Ships are affected to the extent that without propulsion they cannot maneuver to avoid collisions or beaching. On aircraft, fuel starvation is often the result of incorrect fuel management, for example by selecting to feed the engine from an empty tank while fuel is present in another one. On 19 June 1954, a Convair CV-240 aircraft operated by Swissair registered HB-IRW ran out of fuel over the English Channel near Folkestone. The aircraft ditched in the Channel, killing three passengers. Four crew members and two passengers were found alive after the crash. On 3 August 1954, a Lockheed Super Constellation of Air France registered F-BGNA was diverted to Boston after being unable to land at New York-Idlewild Airport due to bad weather. It ran out of fuel before reaching Boston and made a belly landing in a field. There were no fatalities. On 21 August 1963, a Tupolev Tu-124 operated by Aeroflot experienced a landing gear malfunction after taking off from Tallinn Airport. On finding that the nose gear could neither be retracted nor extended, the crew diverted the flight to Leningrad where they prepared for an emergency landing by circling the city burning off fuel. While circling the city the crew made repeated attempts to get the landing gear to lock down; they possibly became over-preoccupied with this and the aircraft ran out of fuel. The crew ditched the aircraft in the Neva River. There were no fatalities. On 17 November 1964, a Dutch F-104 Starfighter crashed into a mountain in Norway when it ran out of fuel following the death of its pilot. The pilot died due to malfunction of the oxygen mask. On 4 June 1967, A British Midland Canadair C-4 Argonaut registered G-ALHG suffered a double engine failure due to a fuel tank selector problem over Stockport, England. The aircraft crashed and 72 of the 84 on board died. ALM Flight 980 was a Douglas DC-9-33CF flying from John F. Kennedy International Airport in New York City to Princess Juliana International Airport in St. Maarten, in the Netherlands Antilles, on 2 May 1970. Multiple diversions due to severe weather conditions and several unsuccessful landing attempts depleted the aircraft's fuel to the point where the crew believed there was insufficient remaining to reach an alternative airport and decided to ditch the DC-9 in the Caribbean Sea. There were 23 fatalities among the 63 on board. On 28 December 1978, United Airlines Flight 173, a Douglas DC-8-61 en route from Denver, Colorado, to Portland, Oregon, experienced a landing gear indicator light malfunction while preparing to land. The aircraft continued to circle in the vicinity of Portland while the crew investigated the problem, but it ran out of fuel and crash-landed in a sparsely populated area, killing 10 and seriously injuring 24 of the 181 on board. On 23 July 1983, due to a chain of events and mistakes Air Canada Flight 143, a Boeing 767–200, was fueled using pounds as the unit of measure instead of kilograms, resulting in only half the required amount of fuel being on board. The aircraft used up all available fuel and glided to Gimli Industrial Park Airport where the airliner landed safely. The aircraft (now decommissioned) became known as the "Gimli Glider." A Cessna 208A Caravan, used for skydiving operations at Jenkinsburg, Georgia, crashed following a loss of engine power just after taking off on 29 September 1985. The aircraft had been refuelled with contaminated fuel; all 17 occupants died. After a string of mistakes and omissions by the pilots, a Boeing 737-200 operating Varig Flight 254 on 3 September 1989 strayed hundreds of miles off-course, ran out of fuel, and crashed in Brazil's Amazon jungle killing 13 of the occupants. Due to the crew's mistake in flying the aircraft west (270°) instead of north-northeast (027°), the aircraft was not found until four survivors walked onto a farm two days later. On 25 January 1990, Avianca Flight 52 was in an extended holding pattern over John F. Kennedy International Airport in New York City due to fog and congested traffic. The Boeing 707-320B was delayed many times before it was given clearance to land, using up almost all of their fuel. On their attempt to land, wind shear, combined with the bad visibility caused them to miss the runway and execute a missed approach. However, before Flight 52 could execute another landing attempt, they ran out of fuel and crashed into Cove Neck, New York, killing 73 of 158. A McDonnell Douglas F/A-18A Hornet of the Royal Australian Air Force, serial number A21-41, was lost on 5 June 1991 after the pilot became incapacitated. The aircraft flew until it ran out of fuel and crashed in a remote part of Queensland. The wreckage was not found until over three years later. The crew of Indian Airlines Flight 440, an Airbus A300B2-101, executed a missed approach procedure at Hyderabad-Begumpet Airport on 15 November 1993 due to poor visibility. During the missed approach a problem developed when the flaps would not retract fully. After some time trying to solve the flap problem and find somewhere to land near Hyderabad, the crew diverted the aircraft to Madras but because they had to fly slower due to the extended flaps the aircraft ran out of fuel. It landed in a paddy field near Tirupati; there were no fatalities among the 262 occupants but the aircraft was written-off. On 23 November 1996, three men hijacked Ethiopian Airlines Flight 961 on a short flight segment from Addis Ababa to Nairobi. The hijackers demanded that the aircraft should be flown to Australia despite the pilot telling them that there was insufficient fuel to do so. After three hours of flying along the African coast and across part of the Indian Ocean, the aircraft ran out of fuel and the engines failed. An emergency landing at Grande Comore Island failed when the aircraft landed on the water just off the local beach, killing 125 people including the three hijackers. On 25 October 1999, a Learjet 35 ran out of fuel and crashed in a field near Aberdeen, South Dakota. All 4 passengers (including golfer Payne Stewart) and the two crew members died. The crash was a result of the incapacitation of the crew due to hypoxia, caused by a loss of air pressure in the aircraft. Having departed from Orlando on a routine flight that should have crossed the Gulf of Mexico to Dallas, Texas, the aircraft flew unmanned for over 1,500 miles before finally running out of fuel. On 12 July 2000, Hapag-Lloyd Flight 3378 had a landing gear problem when it failed to fully retract after takeoff. The pilots decided to continue to Munich but did not realise that their lower speed for much the same hourly fuel consumption (required because the landing gear was not up) meant that they had insufficient fuel to do so. Once the aircraft lost all fuel, the crew attempted an emergency landing at Vienna International Airport but the aircraft landed short of the runway. There were no fatalities. On 24 August 2001, Air Transat Flight 236 suffered a fuel leak while crossing the Atlantic Ocean and lost its fuel. The aircraft glided safely to an air base in the Azores. TAM Airlines Flight 3804, a Fokker 100, suffered fuel exhaustion on 30 August 2002 because of a leak. The aircraft made an emergency landing in a field with its gear up, killing a cow grazing in the field. No-one on board the aircraft was killed. On 13 August 2004, a Convair CV-580 freighter operating as Air Tahoma Flight 185 suffered fuel starvation due to crew mismanagement of the fuel tank system and crashed, killing one of the pilots. On 6 August 2005 Tuninter Flight 1153, an ATR 72 en route from Bari, Italy, to Djerba, Tunisia, ditched into the Mediterranean Sea about 18 miles from the city of Palermo. Sixteen of the 39 people on board died. The accident resulted from fuel exhaustion due to the installation of a fuel quantity indicator for an ATR 42 in the ATR 72; the incorrect indicator was over-reading by over 2,000 kg, leading the crew to believe they had enough fuel for the flight. On 14 August 2005, fighter jets intercepted Helios Airways Flight 522 after the Helios flight failed to respond to air traffic controllers in Greece. The pilots of the fighter jets reported that they observed no pilots in control of the aircraft until shortly before the aircraft ran out of fuel, when a flight attendant named Andreas Prodromou managed to reach the cockpit and attempted to control the aircraft. By the time Prodromou sat at the controls, the plane had exhausted its fuel and then crashed into a hill near Marathon, Greece, killing all on board. Fuel exhaustion was the final link in the accident chain, but as a consequence of cabin depressurization which had disabled the flight crew. On 26 June 2007 a Skippers Aviation Embraer EMB 120 Brasilia on a charter flight was executing a go-around at Jundee Airstrip in Western Australia. During the go-around the crew experienced difficulties in controlling the aircraft, with the aircraft descending to 50 feet above the ground and the bank angle reaching 40 degrees. After regaining control, the crew realised that the left engine had stopped. The cause of the engine stoppage was fuel starvation. On 17 January 2008, ice crystals in the fuel lines of British Airways Flight 38 melted and refroze within the fuel-oil heat exchangers of the Rolls-Royce Trent 800 engines. The ensuing fuel starvation critically reduced engine power on short final into London Heathrow Airport, and the Boeing 777-236 landed just short of the runway. All 152 passengers and crew on board survived, but the aircraft was written off, the first hull loss recorded for the Boeing 777. On 28 November 2016 LaMia Flight 2933 an Avro RJ85 heading to José María Córdova International Airport had been starved of fuel due to time constraints, missing a refueling point in the city of Cobija. The passengers aboard the aircraft were mainly the news media and a football team that was going to compete in the 2016 Copa Sudamericana Finals. The aircraft crashed 10 nautical miles south of the runway. Some time between midnight and dawn on 5 April 1943, the crew of a Consolidated B-24D Liberator named Lady Be Good lost over the Sahara Desert abandoned their aircraft as it was running out of fuel. The aircraft was found in 1959, with the bodies of most of the crew located in 1960. One crew member's body has never been found. On 22 October 1987, the pilot of British Aerospace Harrier GR5 serial number ZD325 was accidentally ejected from his aircraft over Wiltshire, England; the aircraft continued on its own until fuel exhaustion caused it to crash into the Irish Sea. The pilot was killed. On 4 July 1989, the pilot of a Soviet Mikoyan-Gurevich MiG-23, presuming he had engine problems, ejected from his aircraft. The aircraft continued on its own, flying out of the former East Germany into the West German Air Defence Zone and was then escorted by United States Air Force F-15s until it ran out of fuel and crashed into a house in Belgium, killing the occupant of the house. ^ "fuel starvation Definition and Meaning". Dictionary Central. Retrieved 6 June 2017. ^ "Australian Aviation Accidents Involving Fuel Exhaustion and Starvation" (PDF). Australian Transport Safety Bureau: 1. December 2002. Retrieved 6 June 2017. ^ "Fuel Starvation". Fuel for Thought. Civil Aviation Authority of New Zealand. Retrieved 6 June 2017. ^ Aviation Safety Network HB-IRW page Retrieved: 6 December 2007. ^ Aviation Safety Network F-BGNA page Retrieved: 12 December 2007. ^ Aviation Safety Network CCCP-45021 page Retrieved: 12 December 2007. ^ "Royal Dutch Air Force (Koninklijke Luchtmacht) D-8045". International F-104 Society. Archived from the original on 5 June 2010. Retrieved 18 December 2010. ^ Aviation Safety Network G-ALHG page Retrieved: 6 December 2007. ^ "Report on the NTSB investigation of the crash of N935F" (PDF). Archived from the original (PDF) on 5 March 2007. Retrieved 12 December 2007. ^ Aviation Safety Network N8082U page Retrieved: 6 December 2007. ^ Aviation Safety Network C-GAUN page Retrieved: 6 December 2007. ^ Aviation Safety Network N551CC page Retrieved: 12 December 2007. ^ Aviation Safety Network PP-VMK page Retrieved: 14 December 2007. ^ Aviation Safety Network HK-2016 page Retrieved: 6 December 2007. ^ Wilson, Stewart. Phantom, Hornet and Skyhawk in Australian Service. Weston Creek ACT, Australia: Aerospace Publications Pty. Ltd., 1993. ISBN 1-875671-03-X. ^ ADF Serials F/A-18 page Retrieved: 12 December 2007..
^ Aviation Safety Network VT-EDV page Retrieved: 12 December 2007. ^ Aviation Safety Network ET-AIZ page Retrieved: 6 December 2007. ^ Aviation Safety Network D-AHLB page Retrieved: 6 December 2007. ^ Aviation Safety Network C-GITS page Retrieved: 6 December 2007. ^ Aviation Safety Network PT-MQH page Retrieved: 6 December 2007. ^ Aviation Safety Network N586P page Retrieved: 6 December 2007. ^ Aviation Safety Network TS-LBB page Retrieved: 12 December 2007. ^ Aviation Safety Network 5B-DBY page Retrieved: 6 December 2007. ^ AAIB Bulletin S1/2008 SPECIAL Retrieved: 2 October 2012. ^ Ostrower, Jon (30 November 2016). "Colombia plane crash: Jet ran out of fuel, pilot said". CNN. Retrieved 29 June 2018. ^ LaMia Flight 2933#Flight and crash Retrieved: 2 December 2016. ^ "Story of the discovery of the "Lady Be Good" and the recovery of the crew's remains". Archived from the original on 25 February 2010. Retrieved 6 December 2007. ^ "Lady Be Good". National Museum of the United States Air Force. When the aircraft was found three of the four propellers were feathered, indicating that the three engines had been shut down by the crew prior to them abandoning the aircraft. ^ "BAe Harrier attrition list". Archived from the original on 25 January 2008. Retrieved 6 December 2007. ^ List of live ejections from military aircraft for 1987 Archived 21 December 2007 at the Wayback Machine Retrieved: 6 December 2007. ^ "The strange accident of the MiG-23". This page was last edited on 4 April 2019, at 01:21 (UTC).